Valor’s radiant heat advantage is making its way outdoors with the L1 Outdoor Series. The sleek, linear & modern design is optimal for outdoor living. 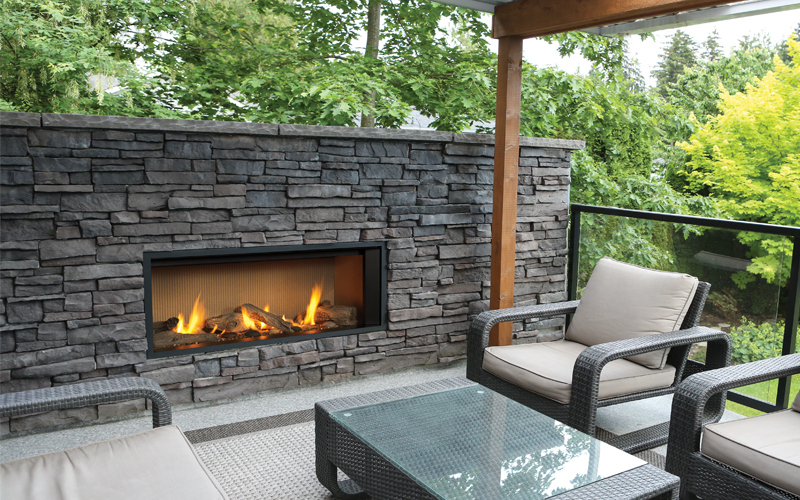 And what better product for outdoor use than a Valor Radiant Gas fireplace? Open fronted fireplaces simply cannot match the radiant performance of a well engineered direct vent fireplace with a glass window. Excess air through an open-fronted unit “washes out” heating performance, causing radiant output to plunge. Using a Valor Radiant fireplace outdoors provides the kind of heat you need to take away the chill and provide glowing warmth. And by using a vented product, homeowners will appreciate the fact that products of combustion are vented away from the seating area. Other unique features such as the 6-hour automatic shutdown to pilot option, will ensure the fireplace shuts itself down if you don’t.